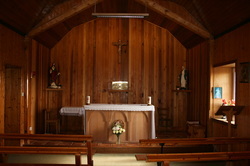 St Joseph’s Howbeg is part of Bornish Parish but served from Ardkenneth. The Church was opened in 1902. The township of Howbeg is famous for Neil MacEachen who was born there and who helped Bonnie Prince Charlie escape from the Hebrides to France in June 1746. His son, Jacques Macdonald, made his name during Boneparte's European wars. Napoleon appointed him Governor of Rome, Duke of Taranto and finally a Marshal of France. But Macdonald never forgot his ancestral home. He visited Howbeg in 1826 and gathered stones and earth from his father's birthplace. When he died, these mementos were buried with him.